It's a race to the finish. 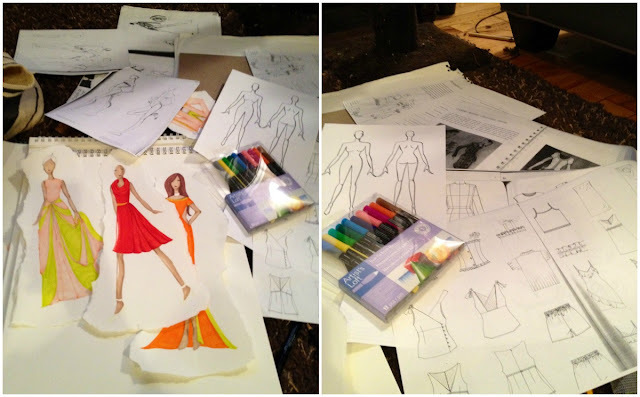 My last fashion illustration class is this coming Thursday and of course I have a final project that is due. We are to design a cohesive collection and include fashion flats (basically a flat drawing of just the garment) with at least 10 looks although, I swear our professor hinted at twice as many for good measure. I am sure you are all thinking that this is probably not that hard a project, right? I mean, all it is is drawing and coloring. Well, I am here to tell you that this is not the case. Being that this is an accelerated course, I have been hoofing it to Boston every Tuesday and Thursday since the beginning of July. We have crammed a lot of learning in and a lot of practicing as well. In order to design and illustrate a successful collection, we have to use all the tools we have learned, including up to what we learned last week. As you can imagine, I am feeling a little frantic because I want these to be perfect and I am 100% they won't be. Wish me luck as I make a mad dash for the fashion illustration finish line, which is sure to be a photo finish. You study such cool things! I always wanted to learn design and work in fashion industry but never was adventures enough to do it. So I ended up having boring office job. Good thing is that I still can do craft projects when I have time.